Good stuff American Patriot. Your work just keeps getting better and better as your style becomes more refined. Also, I love Citizen K, he's a conspiracy theorists dream! Libra: Very fine work American Patriot - it's particularly interesting to see Citizen K fully realised. Horsenhero: Good stuff American Patriot. Your work just keeps getting better and better as your style becomes more refined. Danke for the Compliments my friends! When i came up with Citizen K and his background, i combined elements from a couple of real life dirtbags whom were really into Conspiracy Theories and claiming all kinds of conspiracies that had been arrayed against them when confronted by the truth that proved all their lies were blantant and outright falsehoods! And while Libra gave me some good ideas for his costume, i decided to take the ideas of using his costume to portray some hidden meanings. Libra offered the "All-Seeing Eye" atop a modified Eagle symbol that would look like the one on the Presidential Seal, him wearing a pair of Red Gloves to allude to getting caught in the act (ie, being caught 'Red-Handed') & a faceless mask to hint at his desire to be seen as an 'Everyman' type character. So i used the mask made of the US Flag to portray him hiding behind the flag! And having the flag a little backwards fit as well, since an 'upside-down' flag is a sign of distress... and he believes he's acting as a good guy to retake the country from those whom are destroying it! I'm really thankful to you Libra for that advice... and i'm glad you liked how i used it! On the Jenni Rocket pics... i was hoping to get to hear something back about the color scheme that i went for (the shades of Blue, Grey and Silver) and her emblem being a Rocket that was inspired by the rocket logo that had been worn by the original Johnny Rocket, since the new Johnny Rocket uses a stylized "R" for his logo in the pics i've seen of him. Your design for Jenny Rocket looks strong in it's own right, although I will have to take a look through my FC sourcebooks before I can honestly compare it with what has gone before - also because it feels like just a little bit too long since I read through my M&M sourcebooks! On a more serious note I would love to see the Golden Age Liberty League and Silver Age Freedom League finally given coherent costume designs (there seem to be a multiplicity of designs for the latter and I'm not sure that the character designs of the former have ever been shown in full); I have some ideas for this sort of thing, but absolutely NO artistic talent! Libra wrote: Your design for Jenny Rocket looks strong in it's own right, although I will have to take a look through my FC sourcebooks before I can honestly compare it with what has gone before - also because it feels like just a little bit too long since I read through my M&M sourcebooks! 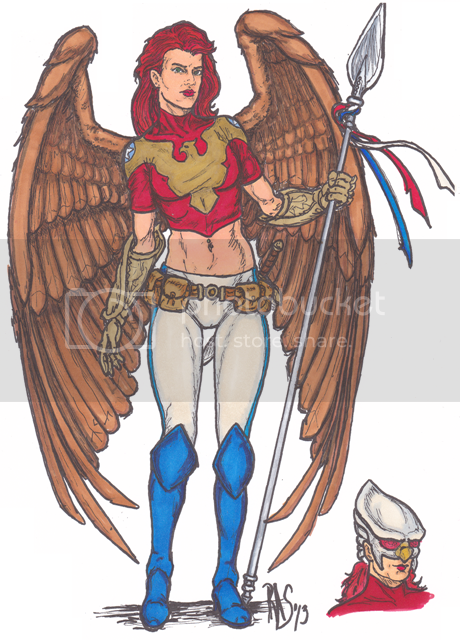 I've seen some of the designs and really liked a few... the Freedom Eagle costume in the Golden Age book inspired the second female Freedom Eagle design. In fact, i've been working on the design... and i think this is the final look that i've been going for. What do you guys think? 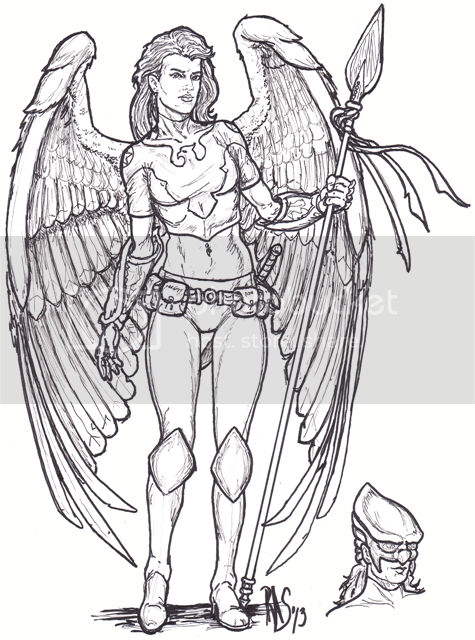 I'd suggest extending the top until it covers that vital concentration of organs around her tummy (also making a few adjustments to the helmet, so the homage is a touch more individual); otherwise I'd say this is an extremely strong rendition of a rather solid character design. My favorite part has to be the wings. But I really like the design overall. The second Freedom Eagle is the granddaughter of the original, Micheal Cameron O'Connor SR, and the daughter of Michael Cameron O'Connor JR & younger sister of Michael Cameron O'Connor III. She's an investigative reporter who works for one of the libertarian newspapers ("The Independent American Statesman", a sixty year old independent paper that came into being in the aftermath of the Second World War, it was inspired by the Battle of Athens that showed American Veterans standing up to a corrupt local government taking up arms to keep the corrupt officials from stealing the elections after they had shot one of the pole watchers when the corrupt sheriff's deputies came in and seized all the ballot boxes) that serves the big sister cities on the East Coast (New York City, Gotham City & Bludhaven, Freedom City and Metropolis). They focus on reporting about corruption in both public and private sectors, keeping people enlightened about legislation coming up in the local, state and federal levels of government. She's smart, sassy and very good at working with her grandfather at working on the Freedom Eagle flight harness and the other gadgets... and he bought her a nice brownstone that acts as her home and headquarters (aka "Freedom Eagle's Roost") that is nearby to their home as a graduation & congratulations gift when she got her first real job with a newspaper (the real reason was that he was proud of her asking him for permission to take up the legacy as the new Freedom Eagle, though he had hoped his grandson would have taken up the mantle... but Michael III is a serious minded businessman who just felt that he wasn't the right person for the job, but supports his little sister with providing her what ever she needs). while Iron Maiden (Toni Stark) is the high society, corporate & political connections as well as providing the team's main funding. Freedom Eagle II and Woman-in-Red (Margaret 'Meg' Allen) provide connections into the underworld and street... while Woman-in-Red's day job is that of a police officer, she has contacts throughout Law Enforcement (especially with contacts in the Freedom City Police Department Internal Affairs & Meta-Human Response Divisions due to the act she comes from a very large family of cops). I'd recommend changing the belt from blue to yellow. You already have the blue stripes down the side echoing the blue top, and I think you need some yellow in there to tie in the eagle symbol. Also, I'd echo Libra's recommendation to tweak the helmet a little. 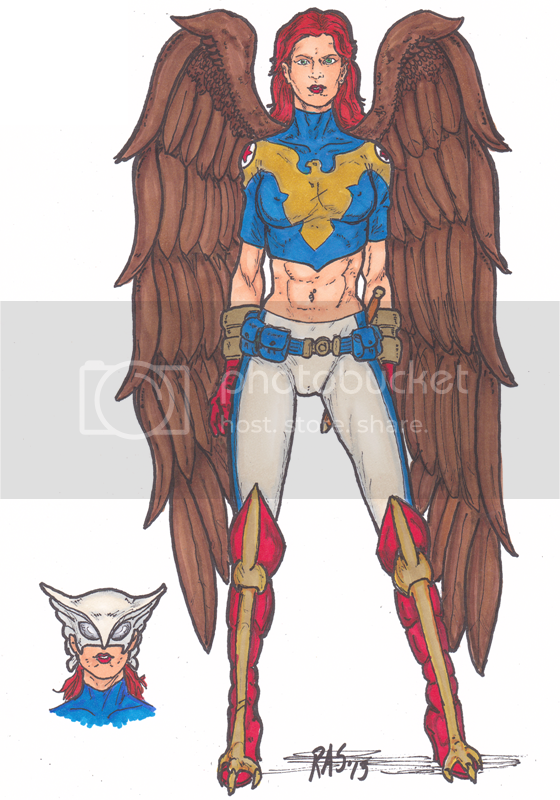 Maybe do with something a bit like hawkman's without the wings at the side would work? Pól Rua wrote: I'd recommend changing the belt from blue to yellow. You already have the blue stripes down the side echoing the blue top, and I think you need some yellow in there to tie in the eagle symbol. I've got an idea for the helmet, namely giving it the shape of those worn by the bicycle racing riders... that tapers into a point in the back to be more reminiscent of the profile of an eagle. i'll post it as soon as i get the design sketched out! and i'll be posting a recolored pic as well. That sounds most excellent Patriot! - it's difficult to improve on such good work, but I can see that you're up to the challenge. Long time no see Patriot. haven't seen you in a while, and noticed your thread here . You got some great art here! JoshuaDunlow wrote: Long time no see Patriot. haven't seen you in a while, and noticed your thread here . You got some great art here! Things have been kind of rough on my end since the last time we talked... but i've not allowed that to stop me. the updated Freedom Eagle II outfit..
any advice or suggestions for improvements? My only concern is that her hair looks to be the same colour as her shirt, which just seems to make it all blend together a little bit. I can't help but wonder if it might work better if her hair was a different shade of red than her shirt. It's okay.. thats what's been bothering me as well... the shade of her red hair is suppose to have strawberry blonde highlights. and when the picture scanned, it didn't show how much lighter her hair is. so i have to come up with a better what of doing the colors when i use my markers.